The successor to the last year Samsung made Nexus 10 has been rumored for quite a while now and there have been reports circulating that the new Nexus Tablet will be either the Nexus 10 or the Nexus 8 and will be made my LG and now we have even more confirmation as @evleaks has just gone ahead and confirmed that the LG V510 is a Nexus Tablet indeed. 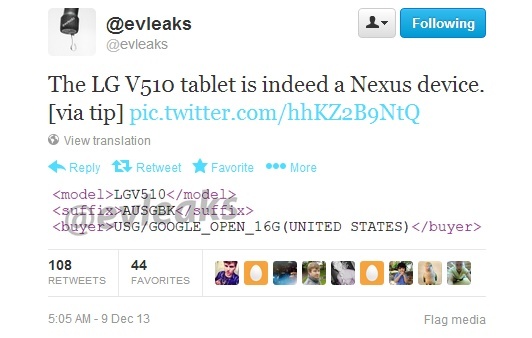 @evleaks has posted an XML data which shows us that the LG V510 is a Nexus Tablet. We are not yet sure if the tablet will be a 8-inch one or a Nexus 10 successor but my money is on the Nexus 10 successor but we’ll have to see if that turns out to be true. In either case we now know that the next Nexus tablet is made by LG and we quite love the LG G Pad 8.3 so we hope LG follows the same design with the Nexus tablet and when it comes to the specs we are pretty sure that Snapdragon 800 is going to be part of it. There’s supposedly a 10 MP rear camera and a 4 MP front facing one. It should come in 16/32 GB variants and the battery is rumored to be monstrous. Well we’ll keep a keen eye out there and bring you more as we get to know. Till then stay tuned.